Cuba has exchanged American citizen Alan Gross for three Cubans jailed in the United States. The prisoner swap is set to pave the way for a major overhaul of bilateral ties, potentially bringing an end to over five decades of severed diplomatic relations. US officials said Gross was transported on a government plane Wednesday morning after being released on humanitarian grounds, which followed a request from the White House. He arrived at Andrews Air Force base near Washington DC. Footage broadcast by MSNBC showed him exciting the aircraft, where he was met by well-wishers. Gross, who had been imprisoned for five years, was viewed as a stumbling block towards improving relations between Havana and Washington. Apart from Gross, Cuba will also release a US intelligence agent who has been imprisoned for 20 years. US President Barack Obama is scheduled make a statement at 1700 GMT on Cuba, the White House said. Obama is expected to announce a shift in Washington's Cuban policy. Cuban President Raul Castro, in turn, is scheduled to address his nation at the same time regarding his country's relationship with the United States. According to US officials, Washington will begin talks on normalizing diplomatic relations with Cuba and opening an embassy in the country, AP reports. The embassy could be opened within months, the officials said. Cuba will also open an embassy in Washington DC. Republican Senator Mark Rubio, a 2016 presidential hopeful from the state of Florida, also said the agreement further includes normalizing banking and trade ties with Cuba. According to Dow Jones, that will include allowing US debit and credit cards to be used on the island nation. 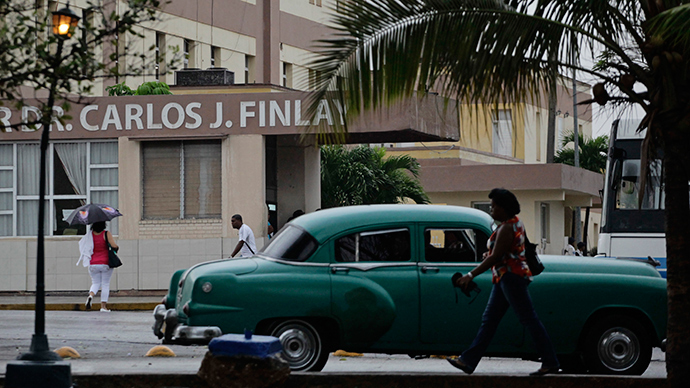 Cuba will also release 53 political prisoners as a response to Obama’s policy shift. Licensed U.S. travelers to Cuba will be authorized to import $400 worth of goods from Cuba, $100 can consist of tobacco + alcohol combined. "This is going to do absolutely nothing to further human rights and democracy in Cuba," AP cites Rubio as saying in an interview. "But it potentially goes a long way in providing the economic lift that the Castro regime needs to become permanent fixtures in Cuba for generations to come." Cuba first arrested the 65-year-old Gross on December 3, 2009. Gross, who worked for the US Agency for International Development (USAID), was sentenced to 15 years in prison for importing banned technology and trying to set up internet access for Cuban Jews which bypassed local censorship. Cuba has regularly criticized USAID's programs as illegal attempts for Washington to undermine Havana. Gross was reportedly in poor health, having lost over 100 pounds and five teeth since his incarceration. He is also said to suffer from a severe case of arthritis. He was handed over in exchange for three Cubans who were part of the so-called ‘Cuban Five.’ The group was allegedly sent by former Cuban President Fidel Castro to carry out espionage in South Florida. The men, who were convicted by a court in Miami in 2001 on charges including conspiracy and failure to register as foreign agents, are widely lauded back home. The United States severed diplomatic relations with Cuba over 50 years ago due to the Castro's socialist reforms and increased cooperation with the Soviet Union. ALong with the severed ties, Washington also imposed a commercial, economic and financial embargo against Cuba in 1960. That embargo was soon expanded to include all imports to the small Caribbean island. The UN General Assembly has condemned the United States’ decades-long embargo against Cuba nearly two dozen times. In 2009, the Obama administration outlined a number of steps Havana could take to help end the diplomatic rift between the two countries. Those steps included the release of political prisoners, allowing US telecom firms to operation within Cuba, and ending government fees on US dollars sent by family living in the United States.